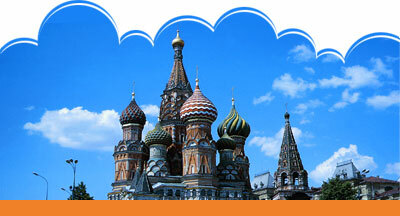 For most of its history, Russian architecture has been predominantly religious. Russia's most characteristic architectural feature is its onion-domed churches, which evolved when the wooden churches of the north were translated into brick and colourful tilework. Churches were for centuries the only buildings to be constructed of stone, and today they are almost the only buildings that remain from its ancient past. The basic elements of Russian church design emerged fairly early, around the eleventh century. Only a few places in the world are destined to become a kind of symbol. One of them is Red Square in Moscow, a symbol of great emotive power. Although the square itself is not very big (695 metres long and 130 metres wide), it impresses one by the richness and variety of its forms which merge in austere harmony. 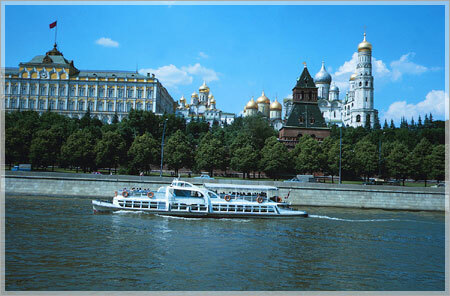 The ensemble is dominated by the Kremlin and the Lenin Mausoleum which stands by its walls. The powerful tent roofs of the Saviour and St. Nicholas towers emphasize the key position of this memorial which links the old ensemble with the present day. Kremlin is the Russian word for citadel, and that's exactly what the Moscow Kremlin was: a medieval walled city on a hill above the Moscow River. Long ago, of course, the city grew far beyond the walls, but the citadel remained the seat of a government. For the last eight centuries the Moscow Kremlin (or Kremle) was the witness of many glorious and tragicevents of our history. There are explosions of hostile guns, celebration of holidays and boiling ofriots near the Kremlin walls. Now the Moscow Kremlin is one of the greatest museums of the world.The Kremlin palaces and chambers are keeping the state regalia, invaluable icons and treasures of the tsars. As ancient chronicles assert, the Red Square appeared at the end of 15th century, when Ivan III ordered to ruin all wooden buildings, surrounding the Kremlin and threatening with the fire, and to allot this area for a market. In Russia the same object might have several names. Thus, The Red Square was officially given its modern name in 19th century, though the name was mentioned in the documents of 17th century. Different centuries left their traces:15th century gave the Kremlin's Wall with Spasskaya, Senatskaya and Nikolskaya towers; 16th - Place of execution. (Lobnoe mesto), and the Cathedral of Vasily the Blessed; 19th century - the monument to Minin and Pozharsky, the building of Historical museum and Upper Trade Rows (GUM), 20th century - Lenin's Mausoleum. The word "red" doesn't refer to the color of the bricks or to Communism. In Russian, the square is called "Krasnaya Ploschad". The word "krasnaya" means both "red" and "beautiful," and the latter, referring to St. Basil's Cathedral at the southern end of the square, was the original meaning. St. Basil's is once again being used for religious services, but one can still tour the inside, where the walls are decorated with antique icons. The most famous and important of the old Russia'a memorial buildings, the Intercession Cathedral (also called the Cathedral of St. Basil the Blessed) was erected in 1555-61 to commemorate the great Russian conquest of the Khanate of Kazan. It was a kind of memorial to all those who had perished in the long struggle to liberate the Russian land from foreign overlordship. And it was built by two fine self-taught masters, Postnik and Barma.This "fairy-tale in stone" has delighted people with its unique forms and colours. Before the extra tiers were added to the Ivan the Great Bell-Tower, the Intercession Cathedral was the tallest building in Moscow (65 metres). For more than four centuries this remarkable edifice has survived numerous fires, natural disasters and enemy invasions to delight and astound all who look upon it. Once the courage of the architect and devotee of Russian culture, P. Baranovsky, saved the church. When ordered to prepare the cathedral for destruction he refused and threatened to cut his own throat on the steps of the church, then sent a bluntly worded telegram to the leader of the party himself relating the above. For some reason Stalin cancelled the decision to knock the church down and for his efforts Baranovsky was rewarded with five years in jail. On Ivan Square you can admire the Tsar Bell and the Tsar Cannon, famous masterpieces of the Russian casting. On Senatskaya Square you can see the building of the Arsenal, the eminent architectural monument of Moscow of Peter the Great's epoch, and the Senate – one of the best creations by famous Russian architect Matvei Kazakov. Old Russian cannons and captured arms of Patriotic War 1812 are exhibited in front of the Arsenal. The ensemble of the Grand Kremlin Palace, the residence of Russian emperors of the XIXth century, is situated on Palace Square. You can have a fascinating tour across the Kremlin – visit the famous treasure-house – the Armoury Chamber. You can see the majestic ensemble of Cathedral Square and its well-known cathedrals, enter the Assumption Cathedral, Archangel’s and Annunciation Cathedrals, the Church of Laying Our Lady’s Holy Robe and the Patriarch’s Palace. You can also visit an exhibition in the Assumption belfry (“Uspenskaya zvonnitsa”).